I have the best memories of watching PBS as a child and I am so happy that JustaBXgirl gets to grow up with her own PBS favorites. One of those favorites is Peg + Cat. And I like watching it with her. This May they released the first Peg + Cat movie and we were able to get a copy to check out for you. I received this movie for review purposes. As always all opinions are honest and solely mine and JustaBXgirl’s. Learning: Staying true to Peg and Cat the movie makes learning fun. In fact, your littles might not even realize they’re learning as they sing along and help solve equations. Even my 7 year old nephew wanted to get in on the fun and solve problems quicker than the TV and JustaBXgirl. And our littles don’t learn only about math. They’re learning about politics too. 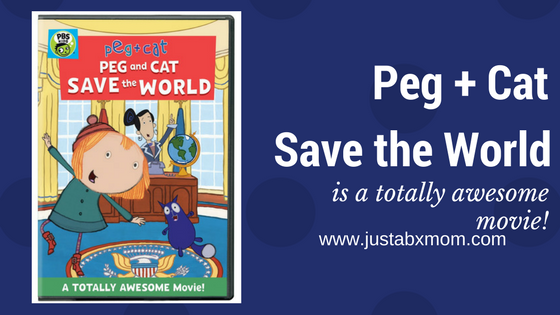 Girl Power: Peg and Cat get invited to the white House to solve a problem of national importance. The president just happens to be a WOMAN!!! Yup, our littles get to see a female president and it isn’t a big deal. There’s no fanfare behind the woman (voiced by Sandra Oh) doing her job. It’s just accepted as the way things are and I think that makes it very, very cool. Animation: One of the things that I truly love about Peg and Cat is that they are drawn in a simple form. There’s no CGI or other fancy animation tricks. The animation allows the littles watching to focus on the story at hand and kind of reminds me of how cartoons looked when I was a little! You and your littles will love this. It’s sixty minutes long and this past February was awarded a prestigious Kidscreen Award for “Best One-Off, Special or TV Movie” in the preschool programming category.